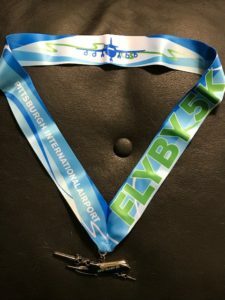 I’m still processing all the awesomeness of this year’s Pittsburgh Marathon Weekend. 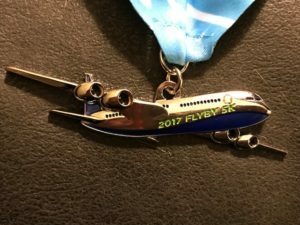 My husband and a buddy crushed the marathon. I had an amazing experience at the half and I can’t stop thinking about it. I was really distracted all day at work on Monday. I can’t put my finger on why this year’s race is sticking with me so much more than any other year. Even the year I first broke 2:30 faded faster than this. Maybe it’s because I’m still sore, I worked really, really hard during that race and I gave it everything. Perhaps even more than the year I first broke 2:30. Perhaps it’s because of the emotional experiences of friends and my husband, who finished the full after not being able to on previous attempts. Maybe because it was just the perfect day. The weather ended up being amazing. It was the perfect blend of work and fun. I enjoyed every second of this race. I took in the city, the signs, the crowds, but I also worked my tail off during it. Maybe the fact I was mid-pack for the first time in such a large race played a role–I’m used to seeing people ahead of me, but not the huge crowd I had this time. It was really awesome. Maybe the fact I did the Steel Challenge factors in. I had a great time in the 5k on Saturday, even though it was raining. I used to hate 5ks, but not anymore. This was fun. Back to back races are fast becoming one of my favorite things ever. Maybe it’s because this year I had SCRR, and while I’m fairly reserved and not the most social person when I’m at group runs/events, I know that I have the support of an amazing community and seeing and hearing their stories and triumphs made the day even sweeter and more memorable. 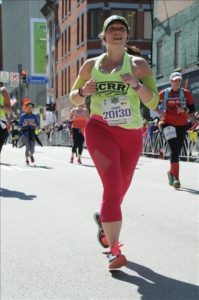 Oh, and how about this race photo where they actually captured me with both feet off the ground? This was the cherry on top of the weekend–evidence that I ‘get air’. My heart is overwhelmingly full from this experience in a way that I’m having a lot of trouble articulating. And with no races on the calendar until mid-June I’m feeling a bit of a void. I need to remedy that quickly, looking at a 10k next weekend, though I also need to focus on re-building some distance for the 12-hour event in June. Then I will shift gears and get into some serious marathon training, because I have some big goals for my fall race. Lots to look forward to and work for. So first a word about good life decisions. I make them. Moving here has been one of the best decisions I’ve ever made, hands down. I’ve been here less than 3 weeks and I’ve already run two 5Ks and today I PR’d. For realsies. So it started Wednesday night. Kristi needed to give up her spot in the Great Race 10k, and Lynn came home at the end of a long day and asked if I had any interest in doing a 5k or 10k this weekend. I said I’d be up for a 5k, but I’m not ready for a 10k yet. So we figure out the details of transferring the registration to my name, and the next day I drive over to Kristi’s to have her sign the form. Lynn turns it in on Friday and comes home with our ‘Swag Bags’. This is happening. I get up at 5 this morning, change into my race gear–it was supposed to be chilly with a good chance of wet. So I’m layered to the hilt. Decide to abandon a layer in the car, which turned out to be a good call. Lynn and I took the 5k shuttle to the start and kill the better part of the hour until start time. The strategy–middle of the road over the start line, then shift left for passing and all that. My goal was to PR. My best 5k time was my first race, what feels like eons ago, and it was 39-something. I wanted to see 38 or better on the clock, that’s all I wanted. We started off and it was clear to me straight off that I love Pittsburgh. I LOVE IT. I love running through this city. I LOVE IT. It’s gorgeous. It’s friendly. And it’s just so much fun to run in. So we started running. And the really fun part about huge races like this for admittedly slow, but improving, runners like myself is that you actually get to pass people. A lot of people. So we’re weaving and bobbing and working our way through the crowd. Lynn was an awesome pacer. I felt solid and steady. I didn’t want to walk or even slow down because there was someone running with me. First mile was a breeze once I warmed up, though I was definitely ready for the water stop at the halfway point. Walked the first water stop. Continued, mile two was a little rougher, a little slower, but we hung in there. I knew that we were 2 minutes behind clock time, so when I heard 27:15 at the two mile I knew I had it in me to PR. I could do 13. So we continued. Last water stop I didn’t want to walk, I wanted that PR so we jogged through. MISTAKE! (Imagine that being sung.) I got a stitch in my side shortly thereafter and had it not been for Lynn I would’ve walked. But I didn’t. I kept going. Kept running. Groaning every few steps, trying desperately to massage the ache in my side, but I kept moving. We kept bobbing and weaving and passing. And after what felt like the longest finish chute EVER (I swear the ones for the half marathons are shorter) there was the clock. We finished. Scanned our bibs to get our times (thank you fancy QR coded bibs! I seriously hope they do that for the half marathon next year). 38:14. BAM!! And that, my friends, is how you PR. (Did I mention that Lynn was an awesome pacer? Totally couldn’t have done it without her.) We got the requisite Smiley cookie (another great thing about running in the ‘burgh) and headed back to the car to change out of our sweaty stuff into warmer stuff, picked up post-race caffeine (Diet Mt. Dew for Ben and coffee for Lynn and I) then made our way back to the finish area to find Kristi and wait for Ben and Kristi’s friend Melissa to finish. Lynn and I were almost hit by the press truck (members of the press riding on a flatbed) and then it started to rain steadily harder and harder as we waited for Ben and Melissa.